I was traveling this past weekend, and that baby blanket is way too big to carry around now, so instead I made a baby hat for my nephew's unborn cousin. 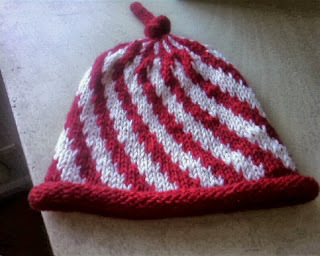 His uncle's wife is pregnant and due on Christmas day, so I made a candy cane hat. The pattern is from Handknit Holidays by Melanie Falick. The yarn is some leftover wool I had in the stash. I suspect that it's Patons worsted, but don't quote me on that. It was fun and easy to knit. I finished it in 2 evenings. Now it's back to the neverending baby blanket.